Such a parent will not allow his children to remain inactive and necessarily find something to do for them. He prefers to establish his rules in the family and demands their observance, his point of view on various things is unchanged. Parents-Scorpios take great care of their family, know how to make friends with their children, but it’s not easy for him to establish contact between the older and younger. Scorpio lacks the important qualities required for the proper upbringing of children. He can be too impatient, quick-tempered, cruel, overbearing. Such parents are very fond of their children, but because of the nature they are unable to fully manifest this love, because they lack sanity and restraint in words. They can at times be too strict and impose increased demands on their children. Scorpions are very intelligent, have intuition, have accumulated life experience, but in practice are absolutely unable to take advantage of the available benefits, so the upbringing of children is not carried out exactly as required. Parents should show loyalty to their offspring, restrain their turbulent emotions, quench their heated passions and learn to trust and serve their children so that they can fully reveal their inherent talents. Otherwise, children grow weak-willed, spineless, ready to go passively, and not fight for a place under the sun. Mother Scorpio considers her child to be a physical manifestation of her love for her beloved man. She is inclined to have many children from a beloved man. She is proud of her children. But this does not prevent her from critically assessing the state of affairs. Scorpio mom is sometimes too busy with her career and intimate life, which forgets about the experiences of her child. She often leaves him in the care of relatives. In the relationship with the child, she lacks the gentleness and patience to listen to their experiences and fears. A Scorpio woman will never allow people to splash out her feelings towards children in public. She was not used to squander caresses to her neighbors in front of other people’s viewers. However, such a mother will always be a reliable protection to her children and will not give them offense by interceding for the victim. It will help children learn to understand people, adequately assess them, choose friends, punch the way to their dreams and goals. Because of his ambition, the mother of Scorpio seeks to have a child surpass his parents in development and life. Therefore, it gives its child a good education, without regretting any means at all. She wants the offspring to grow talented and successful, receive multilateral development and excellent education. But at the same time she forgets that love can not be replaced by anything. 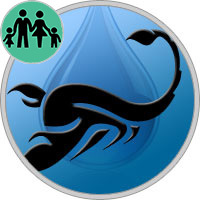 The Scorpio Father treats children with all severity, using his senior authority in the family. He will not grow up lazy and idlers, spongers and losers. In the role of the father, the Scorpions serve their child as an example of responsible attitude, the ability to overcome any obstacles, bring things to an end, achieve the goal with great perseverance and hard work. They feel their child at the level of intuition, so do not lose contact with him, wherever he was, and how many years did not pass from his birth. While the children are small, he protects them and teaches respect for others. Sensing the danger that threatens his child, Father Scorpio always provides support to his child at the right time. Thanks to this ability between the father and the child an invisible inseparable connection is established, based on mutual love. This relationship can be violated by the intolerant attitude of Father Scorpio to his own shortcomings and his child. The child brings more suffering when his father blames himself for something - he suffers with his father doubly and for himself and for his father. This can lead to serious tragic consequences. In addition, the Scorpions are ambitious and heavily forget the offense, showing their child vindictiveness and rancor. These gives rise to fear in the soul of the child. The child at the same time loves and fears his father. When kids grow up and become parents themselves, they feel grateful to their parents for growing up worthy people.